When President Barack Obama announced on July 8, 2009, that he would nominate renowned geneticist Francis Collins to be the new director of the National Institutes of Health, a number of scientists and pundits publicly questioned whether the nominee’s devout religious faith should disqualify him from the position. In particular, some worried that an outspoken evangelical Christian who believes in miracles might not be the right person to fill what many consider to be the nation’s most visible job in science. Collins was unanimously confirmed by the U.S. Senate on Aug. 7, 2009, but the controversy over his nomination reflects a broader debate within the scientific community between those who believe religion and science each examine legitimate but different realms of knowledge and those who see science as the only true way of understanding the universe. A survey of scientists who are members of the American Association for the Advancement of Science, conducted by the Pew Research Center for the People & the Press in May and June 2009, finds that members of this group are, on the whole, much less religious than the general public.1 Indeed, the survey shows that scientists are roughly half as likely as the general public to believe in God or a higher power. According to the poll, just over half of scientists (51%) believe in some form of deity or higher power; specifically, 33% of scientists say they believe in God, while 18% believe in a universal spirit or higher power. By contrast, 95% of Americans believe in some form of deity or higher power, according to a survey of the general public conducted by the Pew Research Center in July 2006. Specifically, more than eight-in-ten Americans (83%) say they believe in God and 12% believe in a universal spirit or higher power. Finally, the poll of scientists finds that four-in-ten scientists (41%) say they do not believe in God or a higher power, while the poll of the public finds that only 4% of Americans share this view. Source: Scientists data from Pew Research Center for the People & the Press survey, conducted in May and June 2009; for complete question wording, see survey topline. General public data from Pew Research Center survey conducted in July 2006; for complete question wording, see survey topline. Numbers may not sum to 100 due to rounding. The recent survey of scientists tracks fairly closely with earlier polls that gauged scientists’ views on religion. The first of these was conducted in 1914 by Swiss-American psychologist James Leuba, who surveyed about 1,000 scientists in the United States to ask them about their views on God. Leuba found the scientific community equally divided, with 42% saying that they believed in a personal God and the same number saying they did not. More than 80 years later, Edward Larson, a historian of science then teaching at the University of Georgia, recreated Leuba’s survey, asking the same number of scientists the exact same questions. To the surprise of many, Larson’s 1996 poll came up with similar results, finding that 40% of scientists believed in a personal God, while 45% said they did not. Other surveys of scientists have yielded roughly similar results. Given their much lower levels of belief in God or a higher power, it is not surprising that the percentage of scientists who are unaffiliated with any religion is much higher than among the general public. 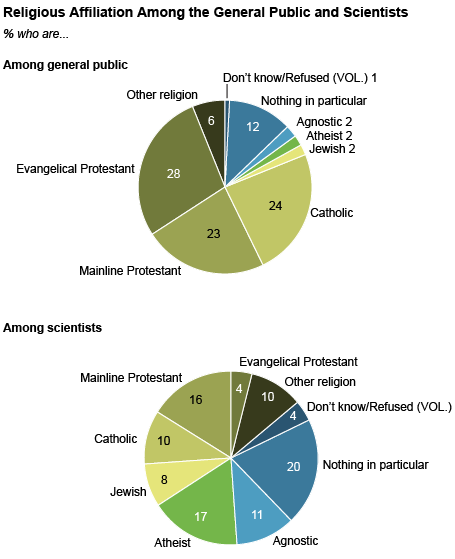 Nearly half of all scientists in the 2009 Pew Research Center poll (48%) say they have no religious affiliation (meaning they describe themselves as atheist, agnostic or nothing in particular), compared with only 17% of the public. Thus, it follows that most faith traditions are represented in smaller numbers in the scientific community than in the public as a whole. For instance, the scientific community is far less Protestant (21%) and Catholic (10%) than the general public, which is 51% Protestant and 24% Catholic. And while evangelical Protestants make up more than a fourth of the general population (28%), they make up only a small slice (4%) of the scientific community. One notable exception is Jews, who make up a larger proportion of the scientific community (8%) than the general population (2%). Source: Scientists data from Pew Research Center for the People & the Press survey, conducted in May and June 2009; for complete question wording, see survey topline. General public data from Pew Research Center surveys conducted between January and June 2009. Numbers may not sum to 100 due to rounding. Source: Pew Research Center for the People & the Press survey, conducted in May and June 2009. For complete question wording, see survey topline. Numbers may not sum to 100 due to rounding.